Truly the epitome of brewing’s two thousand year evolution, Samuel Adams Utopias® offers a flavor not just unlike any other beer but unlike any other beverage in the world. The 2009 release is a blend of batches, some having been aged up to 16 years in the barrel room of our Boston Brewery, in a variety of woods. We aged a portion of the beer in hand-selected, single-use bourbon casks from the award-winning Buffalo Trace Distillery. The latest batch also spent time in Portuguese muscatel finishing casks, as well as sherry, brandy and Cognac casks. This flavorful, slightly fruity brew has a sweet, malty flavor that is reminiscent of a deep, rich vintage port, fine cognac or aged sherry. 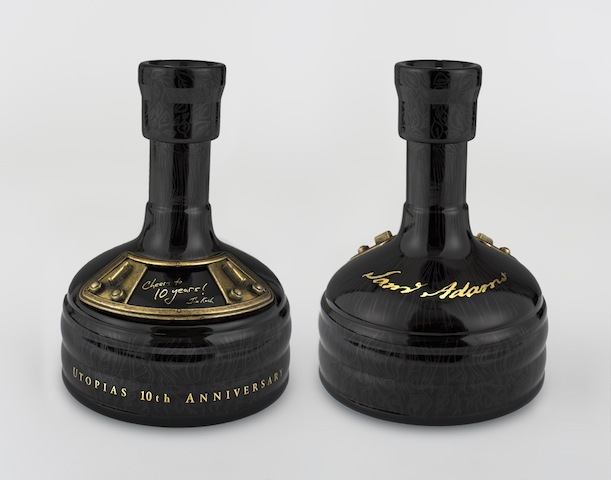 The history of Samuel Adams Utopias comes from the extreme beers of Triple Bock and Millenium that came before it. With those brews we began the exploration of aging beer in barrels for a different flavor contribution. With Utopias, we took that process to another level by introducing a variety of casks that the beer was aged in, each offering their own unique flavor. 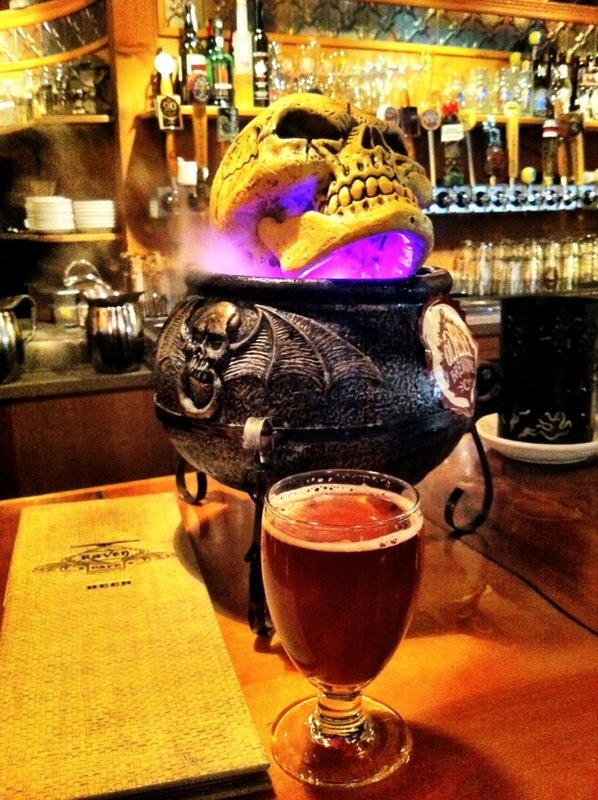 We also experimented with blending different vintages of beer to create its final character. The idea of aging in casks and blending was inspired by the techniques of whiskey makers in how they were able to craft the taste of their liquid from several of these elements. We expanded that notion to include casks of different origins. Applying these techniques to beer not only led to a completely unique beer, but also to a new taste experience. The beer comes in at about 27% ABV. For me, that is just a little too much to spend on beer, but if a friend were to offer me some, how could I say no? As with last year, Halloween this year was another great night of fun with kids and candy, and as always, the adults loved the beer. Candy, I give away a lot of it, I mean A LOT, but it’s for the kids and they love it!!! My family comes over and we have pizza before the evening of kids comes trick-or-treating to our door. I had about 140 kids stop by and went through all of the candy as well as about 25 beers. It’s funny that there are some adults who go out of their way to come to my house just to get a beer. I had three mothers that asked if they could have their beers unopened as they wanted to have them after they put the kids to bed and two more ask for beer to take to their husbands. I was happy to help them out. It’s fun watching the adults decide which beer they’re going to try. 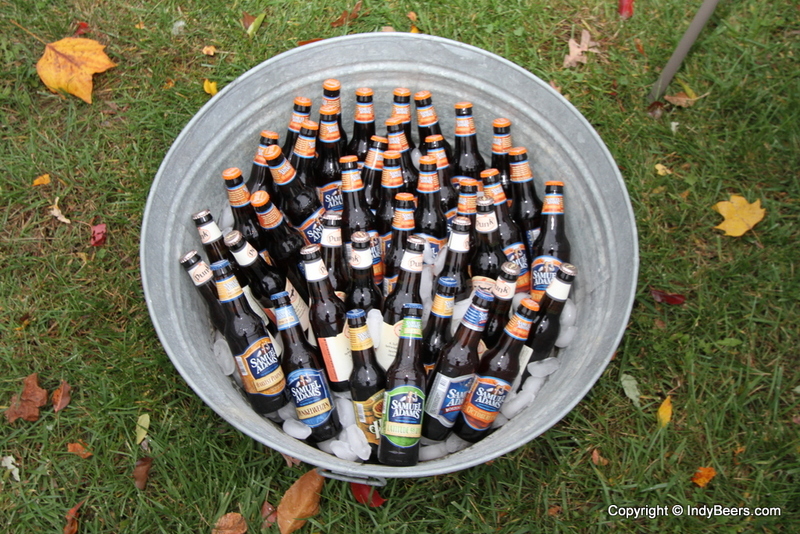 This year’s Sam Adams sampler pack had Dunkel­weizen, Har­vest Pump­kin Ale, Hazel Brown, Octo­ber­fest (which I also had a case of), Lat­i­tude 48 IPA, and Boston Lager. I also had a case of Dogfish Head Punkin ales. 60 beers in all to give away. The line to play the game for big candy. I give away lots of candy every year with a slight twist. There is a game I have all the kids play where they reach into a bag and pull out a poker chip. Most of the chips are white (and I change the odds as needed), but if they pull out the black chip they win an entire sleeve of candy. For those that are older, they know the game (I think I have done it for over 10 years now), and for those that are younger, they are just learning, but they all love it!!! I also bring up my projector and put It’s The Great Pumpkin, Charlie Brown on my garage door. I love to watch the younger kids get sucked in watching the show, and the parents who enjoy the beer don’t mind standing around with a pumpkin ale. What was your setup like this year? Does anyone else give out beer or do prizes? For a number-crunching manager like Brito, an old, family-run company like Anheuser-Busch provided plenty of opportunities for cuts. He laid off approximately 1,400 people, about 6 percent of the U.S. workforce. He sold $9.4 billion in assets, including Busch Gardens and SeaWorld. AB InBev also tried to save money on materials. It used smaller labels and thinner glass for its bottles. It tried weaker cardboard for its 12-packs and cases. 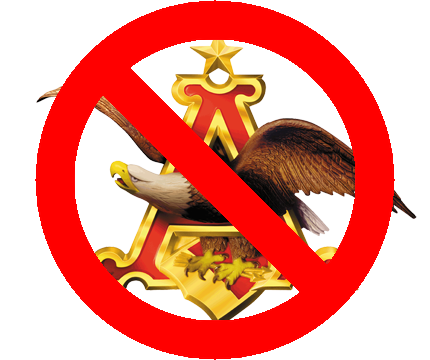 The old Anheuser-Busch insisted on using whole grains of rice in its beer. AB InBev was fine with the broken kind. “Our purchasing of rice has to do with how fresh the rice is, not whether it is whole or broken,” says Vallis. AB InBev is taking a similar approach to Goose Island, a small but respected Chicago brewery it bought in 2011 to combat the growing craft beer threat. Three months after the deal, AB InBev started brewing Goose Island signature 312 Imperial Pale Ale—named after a Chicago area code—in Baldwinsville, N.Y., where the area code is 315. Graham Haverfield, beer director at the Wine Library in Springfield Township, N.J., says he’s received an IPA made in Portsmouth, N.H.; a harvest ale made in upstate New York; and Belgian-style beers from Goose Island’s Chicago brewery. Essentially, AB may be a good business at making money, but they’re horrible at making beer. Have a look at the full article and decide for yourself. This week’s winner is Michael. There were a lot of good posts this week, but his was the obvious, halloween themed choice. In a trendy, gourmet food-and-drink obsessed place such as San Francisco, a generic “cold beer” at AT&T Park often doesn’t cut the mustard as a companion to the stadium’s pungent garlic fries or a Caribbean-style concoction called the Cha-Cha Bowl. Revelers can choose between 56 different beers inside the waterfront ballpark. At Thursday’s Game 2, hundreds of Giants fans waited in a long line to get into an adjoining ballpark bar that sells dozens of craft brews. The offerings ranged from high-octane Belgian Trappist ales to a full suite of city-brewed Anchor Steam concoctions. John Callaway, 50, stood crammed elbow-to-elbow at the bar with his friend Trisha Cruse, 53, sipping a hand-pumped, English-style cask bitters made special for the ballpark bar, the Public House, by San Francisco brewery Magnolia. “I just like English bitters, and they are not easy to find, especially in a ballpark,” Callaway said, grabbing his filled cup and heading toward the ballpark turnstile in the back of the bar. In Detroit, however, it’s a much different scene the the upscale variety available in San Francisco. At Detroit’s Comerica Park, where only a couple of locally made beers are on tap, die-hard Motor City fans are just fine with the unpretentious, established American beer brands. 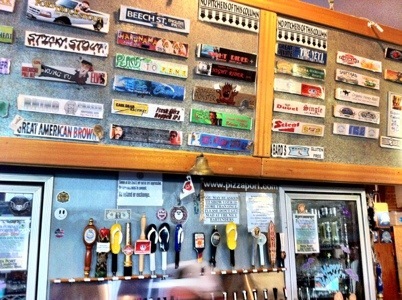 With such a large number of beers on tap in San Francisco, it comes as no surprise that there are lots of craft beers. San Francisco’s craft beer obsession is on full display at the Public House, a ball yard bar on Willie Mays Plaza just outside the stadium’s main entrance. The bar boasts 24 taps (that’s Mays’ retired number), but pours more than 60 different beers, with a focus on local breweries. Unlike bars outside other ballparks, the Public House allows fans to take their designer brews directly into the ballpark through the turnstile tucked away in the back. 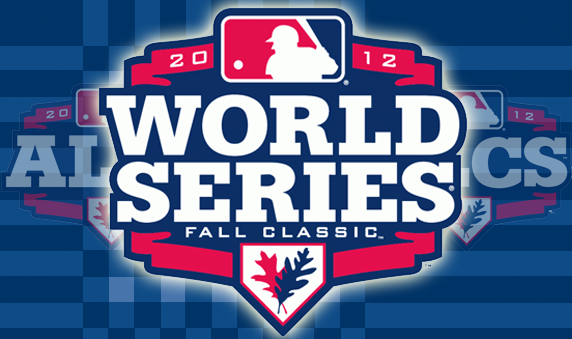 Fans can come back and forth during the game, trying a different ale, cider, porter or stout. While the more adventurous local ales are being consumed in great quantity, the established brands like Coors and Budweiser still lead sales ballpark-wide, Filipiak said. Detroit’s ball yard has more than 130 spots where fans can buy beer on a typical game day, and about 120 of them serve American beers that are household names. While a micro-brewed, chocolate stout served by hand-pump may be a tad too “San Francisco” for Detroit fans, the Tigers’ ballpark does not completely leave craft beer aficionados wanting. Those who look can find about 10 places that sell craft beers, including Atwater, which is brewed at a spot across town, and Galesburg, Mich.-made Bell’s. 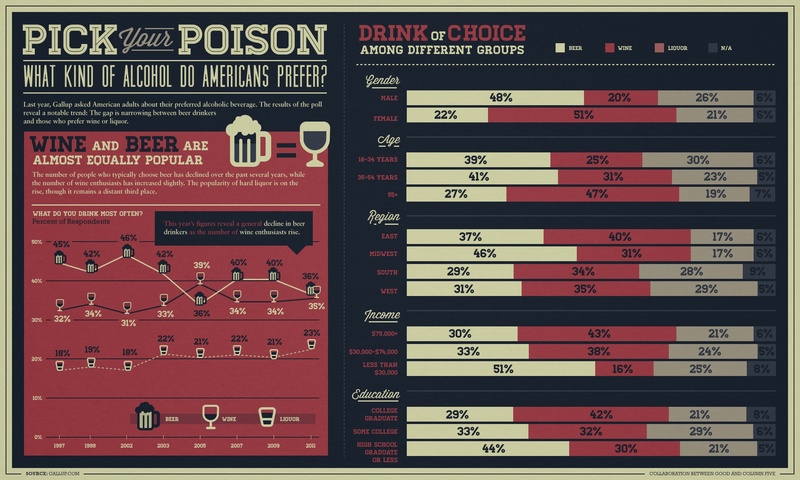 [Infographic] Pick Your Poison: What Kinds of Alcohol do Americans Prefer? With Halloween next week, and most Halloween parties happening this weekend, I thought it would be a good time to see what drinks most Americans enjoy. I’m happy to see beer, for the most part, as the king of the hill. 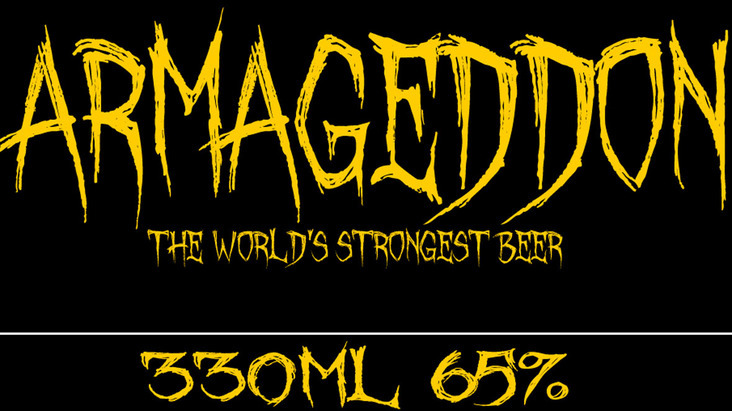 The world’s strongest beer at 65%. Ingredients include crystal malt, wheat, flaked oats and of course 100% Scottish spring water. We then freeze ferment the beer to bring up the ABV. Consume this like a fine whisky. Despite being 65%, the beer has a lot of flavour – malty, hoppy, slightly sweet and lots of yeast still in the beer. Be careful though, smelling it is probably enough to put you over the limit! I guess by way of ingredients this is considered a beer, but strong is the (wo)man who can drink more than one. But is something of this high volume of alcohol really needed in a beer? Brewmeister’s co-founder, Lewis Shand, defended his firm’s new beer and told STV it was intended to be savoured like a brandy, not swallowed in bucketloads. He said: “The Armageddon drink tastes very alcoholic, it is also sweet, hoppy and quite thick, and yes, it is very strong. All our other beers are around four or five per cent proof, and this new brand is meant to be enjoyed in small quantities. Brewery productions director, John MacKenzie, said the beer had a “viscous quality to it, due to the special freeze fermentation method, which we use to produce such a high alcoholic beer.” However, Shand cut to the chase when he was asked to describe the its potency. During standard cleaning procedures, we had a plastic 1/6 bbl. keg manufactured by PKA, Plastic Kegs of America, explode at the seams. this has happened to us twice with individual kegs. We had our instrumentation inspected and it was functioning properly. Apparently there is an installed “safety disc” that will fail prior to the keg exploding as it did….the safety feature was never initiated. Fortunately no injuries were sustained. I have contacted PKA about this and they have been slow to respond. I know there are numerous accounts of this and one ended in death. This issue seems to be a large problem that needs to be corrected quickly. At Ghost River Brewing they have installed the keg washers behind a plexiglass shield. In a message on Twitter, Ghost River employee Joey Vaughan gave a more detailed explanation. It was accompanied by a photo of a broken plastic keg. Vaughan, who now owns a craft beer retail store in Mississippi, told Foster’s he witnessed five plastic beer kegs rupture during his time as an employee at Ghost River, where he operated the keg washer. Why are these kegs used in place of metal kegs? Jim Holton, owner of Mount Pleasant Brewing Company in Michigan, said he’s been using plastic kegs for about five years, ranging from the original European models to newer kegs designed by PKA when it opened in California. “It was a great option for a startup brewery because stainless steel costs have skyrocketed,” he said. The brewery was also suffering from theft of its kegs by people hoping to sell them as scrap metal. Mount Pleasant lost about 100 stainless steel kegs to theft in three years, he said. But this budget saving measure comes at a potentially high cost. Holton said he contacted PKA after the explosion at Redhook, and was assured of the product’s safety. Then on Aug. 6, one of the plastic kegs exploded while it was being cleaned on an automated machine, Holton said. One half of the keg soared upward, denting a 20-foot-high ceiling, and the bottom half slammed into the machine. After the accident, brewery workers inspected their equipment and discovered a pressure reducing valve wasn’t working properly. As a result, the pressure being pumped into the keg could have reached as high as 100 psi, the maximum rating for the air compressor feeding the machine. Plastic Kegs America indicates on its website that the product is designed to operate at a maximum pressure of 60 psi. Holton said the brewery has now installed a double pressure relief valve and other safety components to prevent another keg from blowing out. It seems that Plastic Kegs America is trying to bury their head in the sand when it comes to dealing with this issue. Foster’s Daily Democrat obtained a copy of an Aug. 15 email message sent by PKA Sales Manager Darcie Symons to the Brewers Association’s internal mailing list. The message indicates the company’s products have a maximum working pressure of 60 psi and that the kegs will rupture at a minimum of 90 psi. PKA founder Simon Wheaton declined to comment on the Redhook investigation when he was contacted earlier this month. 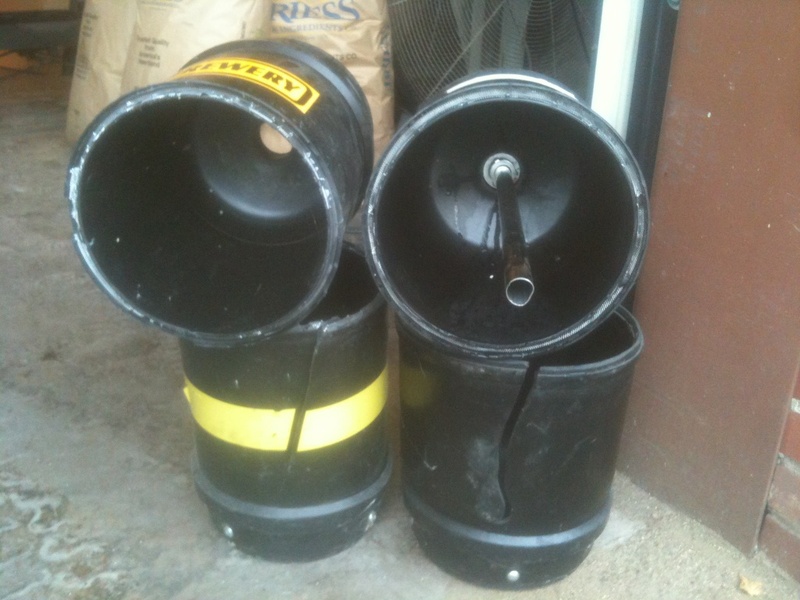 Has industry perception of the plastic kegs changed since these incidents? “The only bad thing about them is their sort of perception on the market,” he said. However, that perception is starting to impact the brewery’s bottom line. Hermannsson said contractors who brew the company’s beer have stopped filling and cleaning plastic kegs. The brewery was also required to use stainless steel kegs at The Great American Beer Festival in Denver earlier this month. The Brewers Association, which sponsors the annual event, did not allow plastic kegs this year. Jeremy Pate, an Alabama brewery industry consultant, said he’s been contacted by at least one client since the death at Redhook who was seeking advice about whether to use plastic kegs. For me, I understand that there is a cost savings in using these kegs, but if there aren’t better safety measures in place to protect those around the kegs, maybe the savings just aren’t worth the risk. This week’s winner is Michael. I love that he added two good pictures to the same post.